When picking summer squash, either in the garden or the grocery store, look for medium-sized specimens. Soft summer squashes have such high water content that you ideally want to get them small (8 inches in length or less), before their flavor becomes too diluted and the seeds get large and bitter. We love cooking up the newest harvests with pasta, as a gratin, or just lightly oiled and grilled with a little salt and balsamic vinegar. Once they’re properly charred, the flesh caramelizes and releases a wonderful sweetness. There’s not a significant difference in taste between green zucchini (C. pepo var. cylindrica) and yellow squash (C. pepo var. recticollis) but you may find that the yellow variety gets seedy when large, and generally does better harvested smaller than its green cousin. 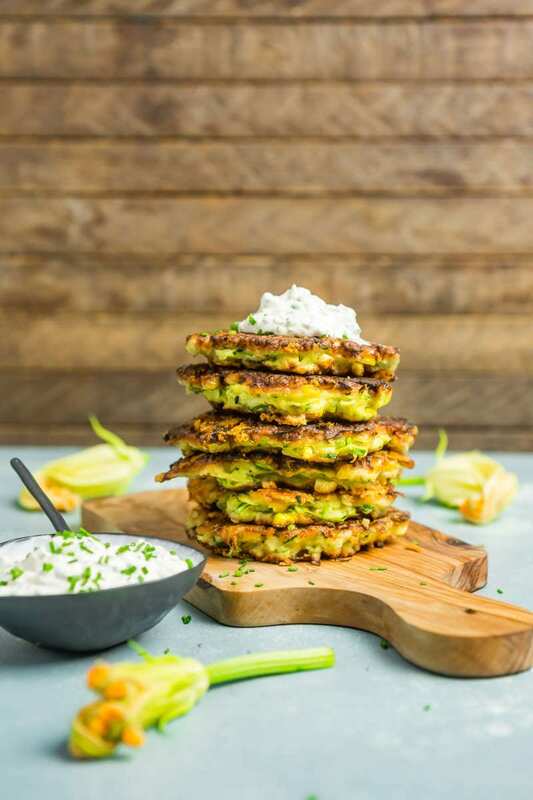 The absolute best way we’ve found both to use up an excess of summer squash as well as dealing with the over-large specimens is to grate them and squeeze out the water to concentrate their flavor. You don’t have to go crazy with cheesecloth and weights to get the water out – pre-salting will help the process along, and you can squeeze batches by hand into a colandar to extrude most of the liquid. At the end of the growing season, when we have a hankering to celebrate, we’ll make a zucchini cake. To get us through the summer, though, we subside on fritters. 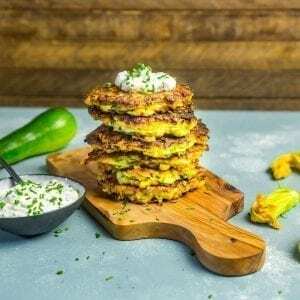 For this recipe, we mix up the squeeze-dried shredded squash* with shredded onion, grated cheese, and a light batter of flour, egg, and seasoning. 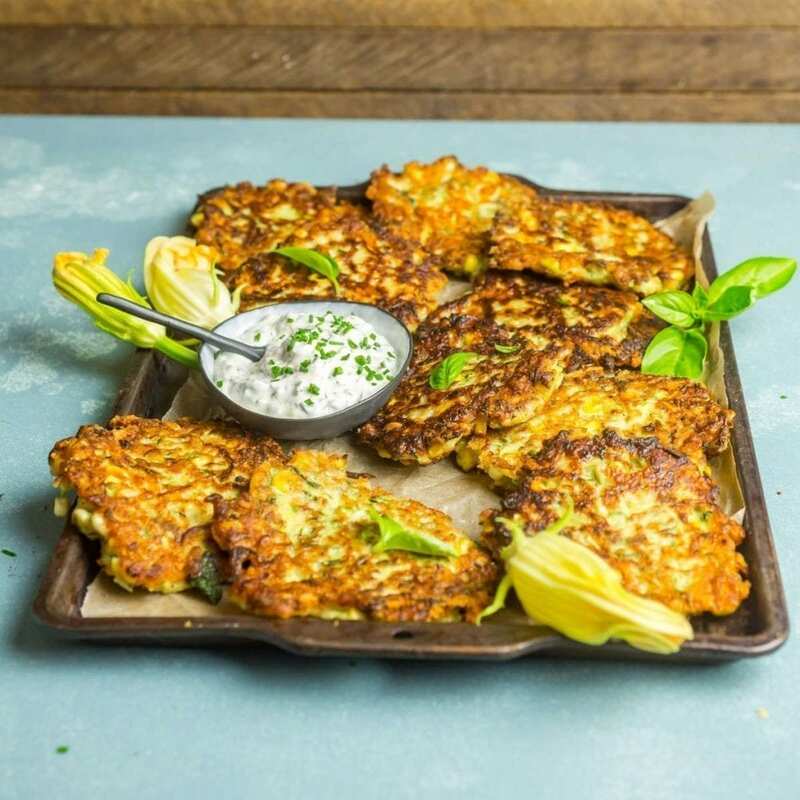 The cheese combines with the vegetables to enhance the melty, gooey interior of the fritter, and helps the outside get delightfully crispy and caramelized like a frico. You can use Gruyère or a sharp cheddar, but we recommend you grate the cheese coarsely to ensure you get delightful melted strands with each bite. * Try saying that fast… oh, you did? Try saying it with a mouthful of fritter. This year we added fresh sweet corn to the mix, since corn comes into season at the same time as squash, and it was such a success that we’ve decided to make it a permanent addition. It creates a more interesting texture, little popping sweet bites amid the tender zucchini. One caveat, though! Corn kernels will pop in a hot pan, so we strongly advise you use a splatter guard to avoid getting splashed with oil and turning into a fritter yourself (you can also hold up a lid as a makeshift shield). We aim for the fritters to be a quarter-inch thick at most; about 1/4 or 1/3 cup of batter is about right, but you can play with the size to find your preference. If you want a thicker fritter, just allow an extra couple of minutes of cooking per side. Along with the fritters, we like to make an herbed sour cream. You can use whatever delicate herbs you have fresh, but a combination of basil and chives is one of our favorites. You could also use tarragon, chervil, or even mint, but add a little at a time so as not to overpower the sauce. It’s entirely optional, but we love adding a little minced anchovy to give the dip a deeper savory note (think of it as a nod to green goddess sauce), but skip it if you want to keep the dish vegetarian. You can also choose to top the fritters with fried or poached eggs, some sautéed diced pancetta or crumbled bacon, and/or a little extra grated cheese. Frankly, we happen to think they’re pretty good with no accoutrements at all. 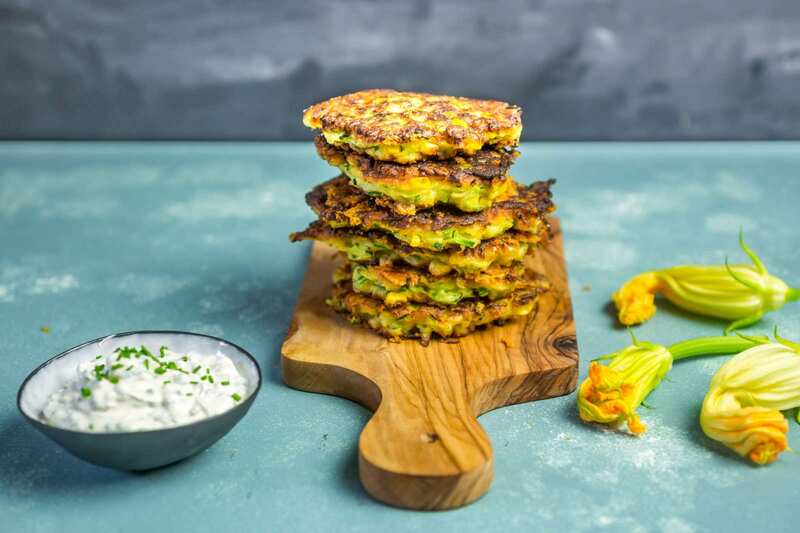 Right now, as our bumper crop comes in, we’re making a batch of these fritters at least once a week, and it’s helping us get through the squash harvest with our sanity intact. Now if you’ll excuse us, it’s been a few minutes, so we’d better go check the zucchini patch. I think I just heard something growling. ​Make the sauce: mix together all the ingredients and set aside. To make the fritters: Preheat oven to 250 degrees. Have a baking sheet with a wire rack ready. Trim ends off zucchini and grate them on the large holes of a box grater, or use the shredding blade of a food processor. Remove the zucchini to colander. Shred onion the same way and add it to the zucchini. Toss zucchini and onion with 1 teaspoon coarse salt and set aside over a bowl or in the sink for 10 minutes. Squeeze out much of the liquid using your hands or a clean dishtowel and add zucchini mixture to a large bowl. Add corn to bowl. Stir in egg, garlic, black pepper, flour, baking powder and shredded cheese. Heat 2 tablespoons of oil in a large heavy skillet (cast-iron recommended) over medium-high heat. When oil is shimmering, drop scant ⅓ cupfuls of batter into the pan. Work in batches so not to crowd pan. You can press them down and shape them with a spoon before they set. The corn will have a tendency to pop in the hot pan, so be careful! You may want to use a splatter guard to protect yourself. Cook until the bottom is golden brown, about 3 to 4 minutes. If they darken too quickly, reduce the heat to medium. Flip the fritters and cook until browned on the other side, about 2 to 3 minutes more. Transfer fritters to baking sheet with a wire rack and then into the warm oven, until ready to serve. Repeat, keeping the pan well-oiled, with remaining batter. 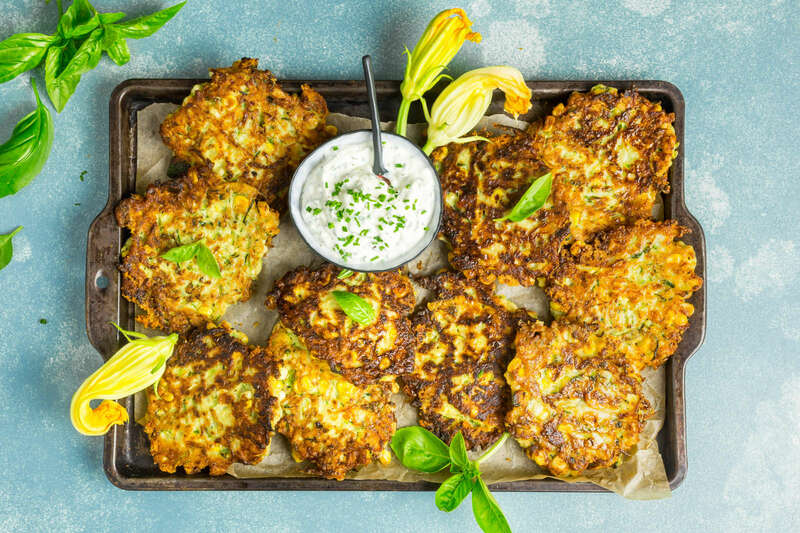 Serve fritters warm, with a dollop of herb sour cream on top. This was delicious and definitely a success, but FYI – if you don’t have a food processor, it takes significantly longer than 40 minutes and is somewhat labor-intensive!